Accra, Dec 21, Graphic -- The Ministry of Defence (MOD) has taken delivery of four new helicopters from Russia, as part of measures to equip the Ghana Armed Forces (GAF), to enable it defend the territorial integrity of the country. The helicopters, estimated at $19.695 million, were purchased with funds from the $55 million loan contracted from the Barclays Bank, by the ministry and approved by Parliament. The loan would be repaid from the peacekeeping account of the GAF. The move formed part of the initiative of the Minister of Defence, Dr Kwame Addo-Kufuor, to adequately equip the GAF to enable it carry out its constitutional duties effectively. In line with the move, the ministry decided to purchase four new multi purpose helicopters for the Ghana Air Force. This later generated a lot of controversy, when the procurement of the helicopters delayed. According to a source close to the Ministry of Defence, the delay was due to an internal problem between the manufacturing company in Russia and the importing agent in Britain, but this had been resolved, paving the way for the shipment of the helicopters to the country. The source said Dr Addo-Kufuor had been invited to visit Russia in February, 2005, to further strengthen the bilateral relations between the armed forces of the two countries. 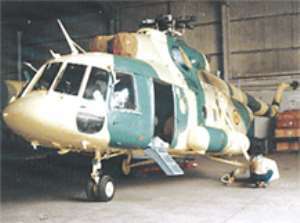 Each of the multi-purposed Mi-17 V5 helicopters, which are bigger than those currently being used by the Ghana Air Force, has a seating capacity of 36. It has all the necessary equipment to provide for troop disembarkation day and night. To reduce the time required for troop embarkation, loading and unloading of cargo, the cabin is provided with sliding doors on both sides and a hydraulically-operated rear ramp. The helicopter can fly with an open ramp, which allows it to transport long-size cargo inside the cabin and perform paratrooping duties. It can carry up to 4.5 tons of cargo underslung and has armour protection of the cockpit and vital systems, proven defence systems against guided missiles, fuel tanks protection, as well as redundancy and backup of hydraulic and electric power sources and main control circuits to increase their combat survivability. The armament of the Mi-17 consists of rockets, missiles, gun mounts and bombs.To perform night missions, the Mi-17 helicopter is fitted with night vision goggles, FLIR system and a searchlight. The Air Force Base Commander, Air Commodore Kwame Mamphey, who conducted this reporter round the helicopters said two of the helicopters would be used to support peace keeping operations and the other two would be used internally for medical evacuations, search and rescue movement of troops and to support government agencies. He said a team of experts accompanied the helicopters to the country to fix the rotor and other parts which were dismantled before air-freighted.He said the experts would be in the country for six months to train their Ghanaian counterparts. Air Cdr Mamphey said some officers of the Air Force had already been trained in Russia and they would in turn train their colleagues on how to operate and maintain the helicopters. He said spare parts and tools had also been acquired as part of the contract agreement to replace any part that would get damaged.